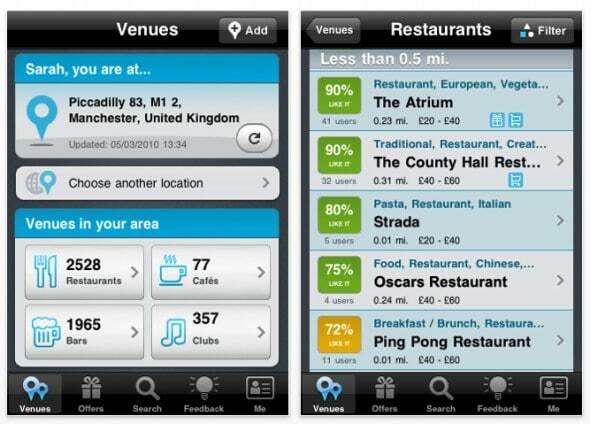 Bliquo is a location-based application for iPhone and Android mobile phones that uses GPS to determine where you are and then shows you a selection of restaurants, cafÃ©s, nightclubs and bars in your area. It’s available for free (ad supported) or at £1.79 on the iPhone and â‚¬1.99 on the Android Market. Once finding my location, Bliquo offered me over 500 restaurants, 500 bars and a selection on cafÃ©s and nightclubs in my area. When navigating between various categories, the speed of pages loading and details of various places was almost instantaneous. After using Bliquo for a while, a lot of great features stood out for me. Many of the restaurants around me had various discounts, which are presented clearly by the name of the place so you don’t miss a bargain! You’ll also be shown how far away the places are without having to select it. Once you find a place you fancy, you can select it to see more information. You’ll be given the address and phone number, so you can see where it is using Google Maps or call them to make a reservation. There are also pictures available for some locations as well as user ratings and reviews to help you decide if you want to go! A really neat feature allows you to make reservations in the app for certain supported restaurants, although restaurants supporting this are few and far between, at least in my location anyway. When testing Bliquo, it performed wonderfully on the iPhone, although there were some stability issues when using it with my Nexus One running Android 2.1. If you’re looking for a location-aware application for your iPhone or Android mobile phone, you should definitely give Bliquo a shot as it certainly compares favourably with the other recent location-based app we looked at, for instance TagCrumbs had many less locations since users are required to create those themselves and that can be tough just after a service is released. With a free version of Bliquo available, you’ve no excuses not to try it out from the iTunes App Store.